This weekend, my significant other and I went on a very unusual weekend getaway. We drove more than six hours to the town of Point Pleasant, West Virginia, to see the eleventh annual Mothman Festival. The festival commemorates the unusual and somewhat tragic history of this small community at the crux of the Ohio and Kanawha rivers. From 1966 to 1967, over a hundred people in and around Point Pleasant reported seeing a flying, bipedal creature. The creature was described as over six feet tall and birdlike with two enormous glowing red eyes. Many witnesses described feelings of overwhelming fear and fascination looking into its eyes. The creature was first sighted by four teenagers taking a night cruise past an abandoned power plant. When the teens fled in their ’57 Chevy, it chased them all the way back to town. Even at speeds near 100 mph, they could not out-drive the creature, which continued to swoop over their car. Local papers dubbed the entity “The Bird” before the label “Mothman” finally stuck. 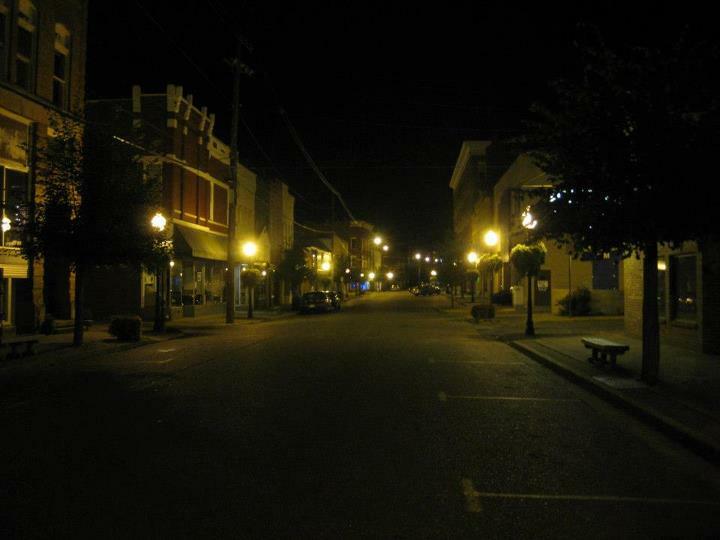 During the sightings, the entire town experienced “high strangeness.” There were dozens of reports of UFOs, poltergeist activity, and cattle mutilations. Sinister “men in black” were also spotted in town. They claimed to be government agents and threatened witnesses not to speak about what they had seen. The strange activity reached its crescendo on December 16, 1967, when the Silver Bridge––which spanned the Ohio River between Point Pleasant and Gallipolis––collapsed. The bridge was carrying heavy traffic and the disaster claimed 46 lives. At the time, it was the worst highway disaster in American history. Initially, some blamed the collapse on an Indian curse. Point Pleasant was built on the sight of Fort Randolph, a colonial outpost. In 1777, colonial militiamen executed Chief Cornstalk, a Shawnee chief who had come on a diplomatic mission. According to legend, with his dying breath Cornstalk placed the land under a curse that was to last 200 years. New legends came to replace the old and many connected the collapse with Mothman. Some suggested that Mothman had come as a portent of disaster. Many of those who settled Appalachia were of Scotch-Irish stock and Mothman has been compared to the banshee of Scotch-Irish folklore. Mothman became nationally famous through the work of John Alva Keel. A writer by trade, Keel traveled the world investigating reports of UFOs, magic, and the unexplained. His life’s work was to discover a single cause underlying all religious and paranormal phenomena from Marian apparitions to UFOs to Mothman. Keel visited Point Pleasant repeatedly during the sightings and made many friends there. In 2002, his book The Mothman Prophecies (1975) inspired a film starring Richard Gere. In the wake of the film, Point Pleasant’s Jeff Wamsley began organizing an annual Mothman Festival. The festival has grown every year and brought much needed tourism dollars to Point Pleasant. 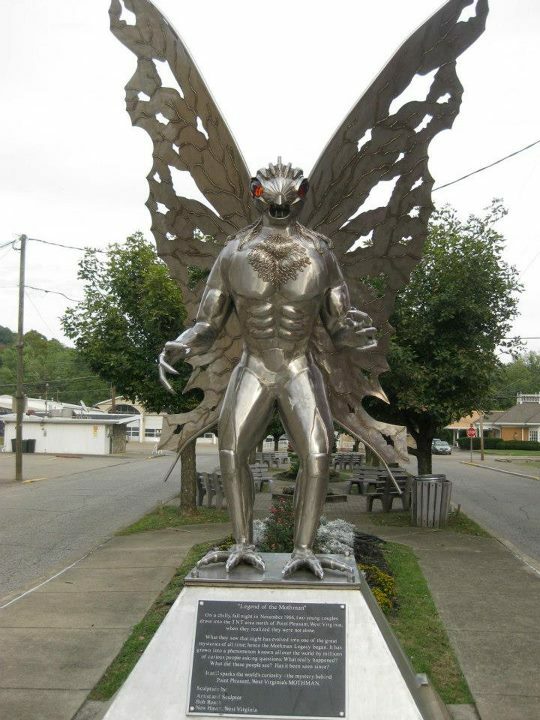 In fact, A life-size and rather awe-inspiring metal statue of Mothman now dominates the center of town. Like many local festivals, there are hot dogs, funnel cakes, and live music. The festival also features a forum where visitors can attend lectures by a variety of cryptozoologists, folklorists, and paranormal investigators. The Mothman Museum is open year round and features information about the sightings, John Keel, and the bridge disaster. The festival attracts a curious mix of local families and paranormal seekers. The Mothman legend has also drawn the attention of religion scholars. In addition to my own work in this area, Jeffrey Kripal discusses the Mothman legend and the work of John Keel in his book Mutants and Mystics. Darryl Caterine also visited Point Pleasant while researching his book Haunted Ground on paranormal pilgrimage sites. The legend offers much for religion scholars to explore. Keel believed that our world is haunted by trickster entities who appear as whatever we humans expect to see––angels and fairies to some, a Mothman to others, and extra-terrestrial visitors to still others. The Mothman legend has a similarly Protean quality. It can be studied as folklore, a case study in social psychology, or a scientific mystery. As a cultural text, the legend has many facets that reflect the everyday life and history of the community. The Cornstalk curse reflects the removal of Native Americans in the eighteenth century. The men in black reflect Cold War paranoia as well as suspicion of the federal government. The abandoned industrial areas where the creature was believed to reside points to ambivalence over the coal and power industries, which bring needed jobs as well as devastating pollution to the area. And of course there is the memory of the Silver Bridge, which claimed dozens of lives shortly before Christmas. As the legend continues to evolve, I still ponder the full implications of Mothman. This entry was posted in Joseph Laycock, Scholarship on the Road, Theory in the Real World, Uncategorized and tagged haunted, Mothman Festival, paranormal, UFOs. Bookmark the permalink.